The world of online reviews has become an intense battle ground. The hotel industry, perhaps more than any other, knows this all too well. With the expanding popularity of review sites and the never-ending growth of social media, the power of guest feedback resonates louder than ever. The time has arrived for hoteliers to have more control over their online reputation. 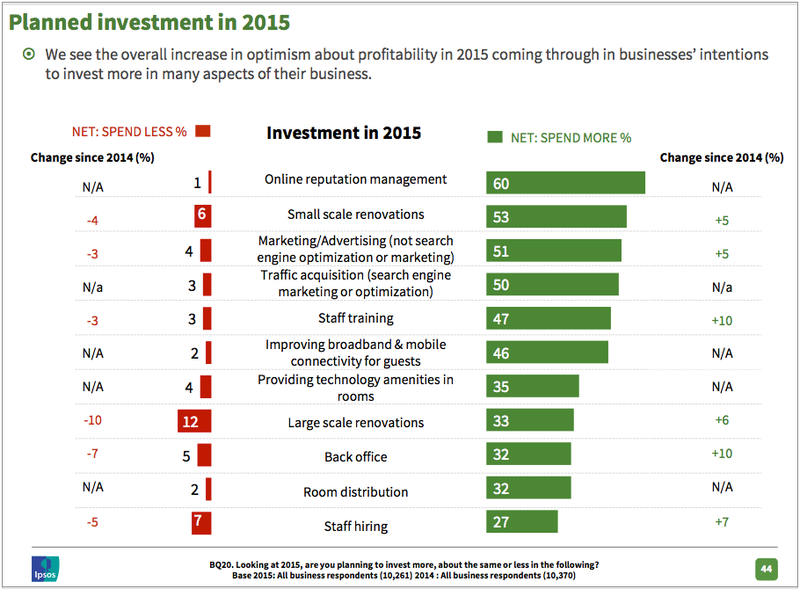 A study released by TripAdvisor in March 2015 highlights exactly this, identifying online reputation management as the most important sector for investment in the industry for the upcoming year. When asked whether they would invest more, less, or the same amount in various areas of their hotels, hoteliers responded with resounding agreement: 60% said they would invest more in online reputation management while just 1% said they would invest less. Improving digital engagement for hotels was also a clear priority, with hoteliers identifying marketing/advertising and search engine optimization as critical areas of investment in 2015. This focus on online reputation management also agrees with other aspects of the study. When asked what area is most important for the future of business, 80% of hoteliers responded by identifying “increasing repeat business” as the most important, with “online travel reviews” (75%) and “overall online reputation management” (73%) also proving to be vital goals. While travelers are unlikely to relinquish the culture of leaving comments and reviews about their hotel experience, the report underscores that globally, hoteliers have identified the tremendous importance of their online reputation to the future success of their properties. But, the impact of of public guest feedback on a hotel’s online reputation has some hoteliers nervous. A negative comment online can have a huge affect on a hotel’s reputation, and hoteliers have no control over what guests choose to post online. And, with all the hard work they’re already doing to keep a hotel operating smoothly hoteliers don’t have time to monitor every one of the dozens of OTAs, meta-OTAs, and review sites for new comments. Gone are the days when hoteliers need to manage each review site or social media platform separately. With today’s technology, hoteliers respond to online reviews from one dashboard, gain data insights with sentiment analysis, and use that data to improve operations based on real comments from guests. Another advantage of today’s technology? Comments left in foreign languages can be translated instantly. Now, with the burden of language barriers lifted, these comments are now a way for hoteliers to expand their reach into new markets and gain insights into the expectations of different kinds of guests. With this profound knowledge, hoteliers’ need to defend themselves against a wave of concerning reviews diminishes. Instead, reviews can be harnessed as invaluable recommendations vetting the strengths of your hotel.